Students gain insights from PhDs who have successful careers in industry, non-profits, government, and higher education administration. Organized by specific career fields, like publishing, consulting, or project management. Learn how PhDs leverage their skills and abilities in their new careers. Our panelists share tips on how to navigate the non-academic job market. Many of the skills developed during graduate school are in high demand in the private sector: the abilities to find, process, organize, and present information are valuable skills to businesses of all sizes. The variety of opportunities available in the private sector allow PhDs to build careers that align with their values, as well as leverage their skills and knowledge. This career panel features PhDs with degrees in Media & Communications, Psychology, Biology, and Biomedical Sciences. 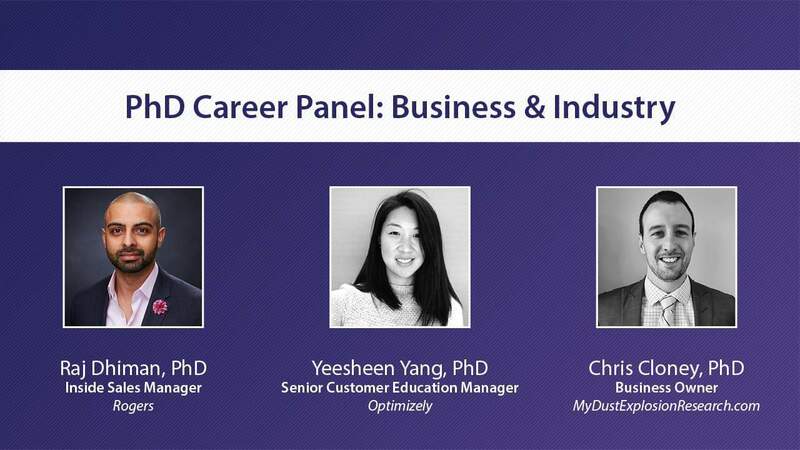 This career panel features PhDs from Literature, Chemistry, and Chemical Engineering, who now work in the private sector. Data scientists don’t just crunch numbers, they find, organize, combine, and extract meaning from information. Data scientists organize and analyze raw data to improve its usefulness for the organization. They work in many industries, including start-ups, large corporations, universities, and non-profits. They spend time running statistical programs, writing code, and organizing data sets. This career panel features PhDs from Political Science, Biology, and Linguistics. Professionals in this field work within organizations to improve program outcomes. They assess the strengths and weaknesses of programs, policies, products, and services to improve their effectiveness. Important skills include research design, data analysis, synthesizing information, and communication. They present their findings and make recommendations to help clients and stakeholders achieve their objectives. This panel features degrees in Psychology, Education and Linguistics. Educational technology and instructional design is a field for PhDs who enjoy teaching and are interested in technology. Instructional designers analyze, develop, and evaluate instruction in various settings such as academia, business, and the military. Educational technology focuses on the technology used for instruction and student assessment. This career panel features people with degrees in Philosophy & but PhDs from all disciplines find success in ed tech and instructional design. Self-employment offers individuals control over their time, location, and activities. However, freelancing brings quite a lot of risk. Uncertain income, unknown future projects, and other worries are standard for individuals working for themselves. PhDs considering a freelance career should be self-motivated, strategic thinkers and problem solvers, and comfortable with risk. This career panel features PhDs from Industrial & Operations Engineering, Sociology, and Screen Arts & Cultures. Public employees work for local, state/provincial, and federal governments. PhDs work in a variety of roles: analysts, researchers, scientists, project managers, diplomats, human resource specialists, and communication specialists … and so many more! Government is one of the largest employment sectors for PhDs. This career panel features PhDs in History, Biology, and Political Science. This career panel features panelists with degrees in Cognitive Neuroscience, Political Theory, and Educational Policy. Remaining in higher education in a non-faculty role is appealing to many PhDs. The day-to-day life of staff and administrators, however, is very different from that of faculty members. Working in higher education administration requires strong project management skills, the ability to collaborate and work on teams, interpersonal skills, and adeptness at navigating bureaucracy. This career panel features PhDs in History, English Literature, Biomedical Sciences, and Psychiatry. This career panel features PhDs from PhDs in English Literature, Comparative Literature, and Educational Leadership. Transitioning into teaching K-12 might feel like a natural career progression for PhDs, especially if they gained a lot of classroom experience while completing their doctoral studies. In some instances, however, the transition might be a difficult one. Many PhDs who transition into K-12 teaching are required to attain more education, such as a teaching certificate, to begin teaching K-12. Teaching K-12 requires a strong interest in teaching, pedagogy, and engaging with children and adolescents. K-12 teachers also supervise clubs, extracurricular activities, advise small groups of students, and participate in board meetings and administrative committees. Therefore, this role requires strong interpersonal, time management, and classroom management skills. In this career panel, you’ll hear from PhDs in History, English Literature, and Neuroscience. Management consultants lend their expertise on a short-term basis to help client organizations identify and find solutions to specific problems or challenges. They use their skills to improve performance and organizational culture, and increase efficiency. Management consultants work in all industries: the private sector, government, non-profits, and higher education. They work for firms large and small, or as independent contractors. This career panel features PhDs from History and American Studies, but PhDs from all disciplines find success as management consultants. After years of researching and writing, PhDs are well-suited for careers in marketing and communications. While writing intensive programs like English and history are obvious fits, the ability to translate discipline-specific information, especially in the sciences, is a valuable trait that organizations desire. Research is important and the ability to summarize and interpret information are skills used just as often as writing. This career panel features PhDs from History, English Literature, and Cognition Neuroscience. PhDs are drawn to work in non-profits where the mission of the organization aligns with their personal values. Research analysis and communication are in high demand for analyst and grant writing roles. Content expertise and teaching experience are valuable for program and event planning positions. Strong communication skills and the ability to build relationships are desirable for working on the development side. This career panel features PhDs from Geography, Behavioural Medicine, Global & Sociocultural Studies, and History. A medical science liaison works in the medical affairs sector. MSLs serve as intermediaries between healthcare professionals and the products developed by the companies they work for. Largely, medical science liaisons carry out three major tasks: they provide education to key opinion leaders and healthcare professionals about their company’s products; they gather field insight from health care providers; and they support clinical trials for their company’s products. These career conversations feature PhDs from medicinal chemistry & molecular pharmacology, biomedical engineering, and oncology. This career panel features PhDs from Medical Biophysics, Behavioral Neuroscience, and History. Careers in policy and advocacy allow PhDs to leverage their subject matter expertise, and research and analytical skills, to implement social and political change. PhDs are valuable to organizations as content experts, researchers, and communicators. Professionals in this field synthesize and analyze information, present findings, and make recommendations to diverse stakeholders. They work in all sectors for firms large and small. This career panel features PhDs from Literary & Cultural Studies, Environmental Science, and History. Program managers are instrumental to organizations of all sizes. They plan and implement programming, coordinate meetings, plan events, create content and marketing plans, and collaborate with colleagues. Project and time management are important competencies. Strong interpersonal communication skills are essential, as program managers are called upon to communicate progress, lead teams, and provide client and customer support and service. This career panel features PhDs from Molecular Biology, English Literature, and Linguistics. Project managers are highly organized. They plan, implement, and deliver short and long-term projects. To do this, they manage teams of people, breaking down large projects into discrete tasks. Managers lead teams, negotiate relationships, monitor progress, and keep comprehensive records. Professionals in this field may use specific project management software and techniques. Meetings and communication are important to ensure work proceeds smoothly. They work across industries and sectors and can be found at large and small organizations. This panels feature PhDs in History, Neuroscience, and Chemical Engineering. PhDs from all fields work in the publishing industry. Professionals in this field stay up-to-date on current research trends, solicit proposals and manuscripts, work closely with authors, and manage the publication process. Roles include acquisitions editor, marketing specialists, sales reps, and digital managers. Project management, communication, relationship building, and attention to detail are important for success in this field. This career panel features PhDs from Neurobiology, Anthropology, and Communications & Rhetoric. Research administrators provide institutional support to researchers, including faculty members, postdocs, and graduate students. They ensure that projects meet ethical and legal standards, assist in writing proposals, locate funding, review award applications, and monitor projects and finances. Professionals in this field spend time communicating with researchers, reading publications, studying research, analyzing grant data, leading seminars, writing and working on committees. 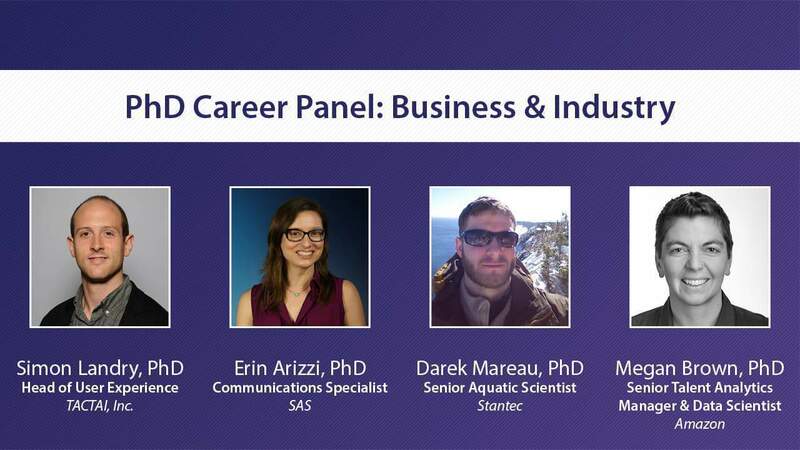 This career panel features PhDs from Biochemistry, Neuroscience, and History. Student affairs professionals facilitate learning and development for students and postdocs at institutions of higher learning. Professionals in this develop and implement programs, mentor and advise students and postdocs, plan events, and lead workshops. Strong communication, leadership, and interpersonal skills are required. They work in student and postdoctoral affairs offices, career services, the graduate school, and university medical centers. This career panel features PhDs with degrees in Biomedical Sciences, English Literature, and Higher Education. UX researchers position themselves between the company and the consumer, acting as a liaison to improve products. PhDs have already acquired many of the important skills for a career in UX research, including qualitative and quantitative analysis, excellent communication, and teamwork. Whether they’re building digital applications for government, helping business owners, or managing the world’s largest development community, UX researchers are helping people improve lives through the systems, applications, and services we use the most. This career panel features PhDs from Management, Cultural Anthropology, and Anthropology.